The genus Gloxinia is comprised of three species, G. perennis, G. erinoides and G. xanthophylla. All produce flowers on a raceme, with individual flowers associated with reduced leaves/bracts, and the usual pair-flowered cyme reduced to a single flower. Although they are otherwise quite different (especially in the size of the plants and flowers), recent phylogenetic studies have confirmed their affinity to one another. They are distributed primarily in the Andes of South America, although G. erinoides extends into Central America to Costa Rica. 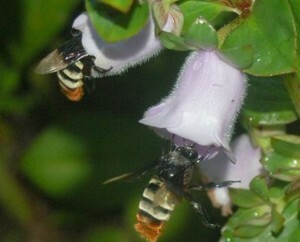 G. perennis has been widely cultivated, and has naturalized in many tropical locales. Many species formerly lumped within this genus have been transferred elsewhere. In particular, a cluster of species with mainly red tubular flowers have been transferred to the genus Seemannia. While they have some affinity with Gloxinia, they are more closely related and similar to each other than to the species clearly within Gloxinia. Gloxinia erinoides was previously known as Koellikeria erinoides. Gloxinia xanthophylla was formerly known as Anodiscus xanthophyllus. Gloxinella and Gloxiniopsis are genera with some apparent similarities to Gloxinia. However, neither is in fact closely related to this genus.